Comprising two front mower models and three rear mower models, we put to test John Deere’s latest triple mower combination. James Rickard reports. 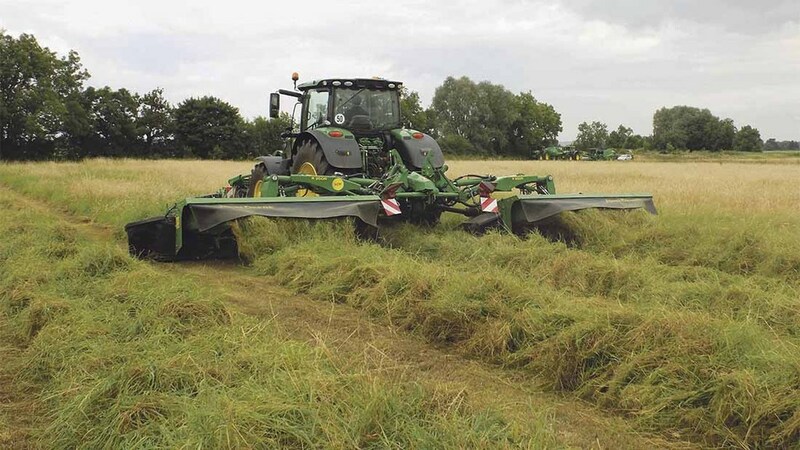 Robustness and convenience are at the core of JD/Kuhn’s latest mower/conditioner development. Redesigned from the ground up in a joint collaboration with Kuhn, John Deere’s latest triple mower combination features new beds, conditioners, headstocks and framework. Front mower models available are the F310R (3.1m cutting width) and the F350R (3.5m). The F310R is effectively a replacement for the current 131; however, the 131 will still be produced for people who need a replacement mower to match older triple mower units such as the 388 and 488, or single mounted mowers; the 324, 328 and 331. Mainly due to transport restrictions, it is likely the smaller F310R will be a more popular than the larger F350R. Rear mower units include the R870R with two, 3.1m beds, the R950R with 3.5m beds and the R990R with 3.5m beds, which can only work with the widest F350R front mower. As yet, there is no grouper option available for the new rear mowers. For this, the old 488 model is still required. To try out the new mowers, we hung a F310R front mower and a R950R rear mower off a John Deere 6215R and set it to work in, what can only be described as, some snotty old grass. Designed with higher power tractors in mind and faster working speeds, drivelines to the bed and conditioner on all three mowers is done via a gearbox positioned at one end of each mower bed. No pulleys are used to alter conditioner speed either, which can now be done via a two speed gearbox (750 and 1,000rpm), simply changed using a lever. A pump inside the gearbox provides a pressurised lubrication system. Unlike gears in a bathed lubrication system, the gears are not constantly churning oil, no swash plates are required and temperatures are kept cooler. The gearbox is tucked neatly behind the mowers suspended frame, so should be well protected from obstacle strike. Conditioner protection comes from a shearbolt, which can be re-fitted in one of three positions, so no need to exactly line up the conditioner shaft to where it was before. 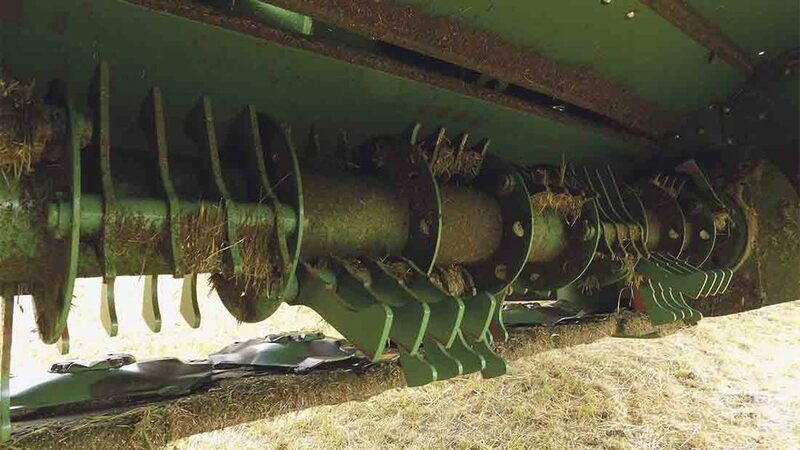 Should a disc come into contact with a large obstacle, mower beds feature a shear shaft design on all the discs to prevent damage to the bed. 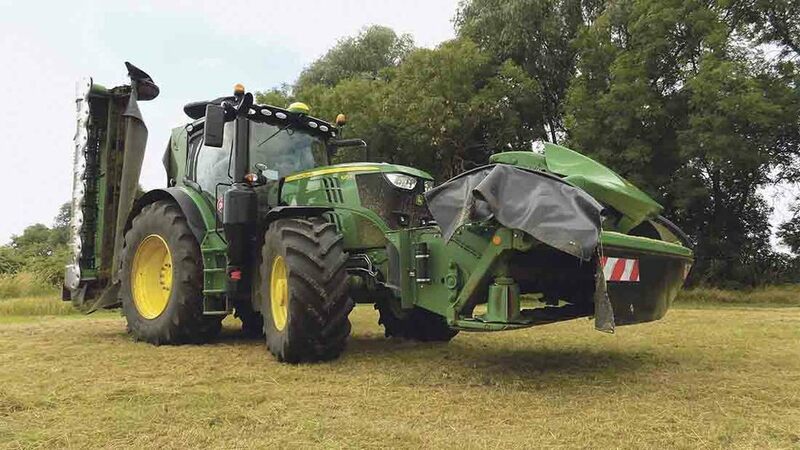 For the front mower, a 90 degree gearbox, which takes drive from the tractor’s pto, can be ‘flipped’ by 180 degrees, allowing it to be tailored to clockwise or anticlockwise front ptos. It can also be specified as 540 or 1,000rpm drive. A new conditioner features pre-loaded steel tines, which flail outwards during work via centrifugal force. To aid this action, each tine features a larger mass of metal at the tip. As a result, tines are less inclined to ‘tip’ backwards due to the amount of crop flowing over them. This keeps up the conditioning action, producing an even fluffy swath, even in our poor grass conditions. Also, tines positioned between discs are a touch longer than those over the tops of the discs. This reduces almost any chance of any crop escaping under the conditioner, especially in heavy crops. Rather than support itself, mower bed design for all three mowers sees the bed suspended in separate cast frames; one either end of the bed. As well as being tougher, particularly useful for the ends of the bed which take the most punishment, other advantages include less stress on the mower bed and more room for bed oil. In addition, the bed now features a thinner and longer profile, allowing it to get under the crop better. Discs are also positioned as far forward on the bed as possible for improved crop flow over the discs. Both attributes proved particularly useful in our tangled crop of grass, producing a very clean finish of cut. Suspension systems on both the front and rear mowers are spring free and use adjustable, hydraulic accumulators to cushion the beds. What looks like design inspiration taken from a hammer head shark, the front mower employs a three-point suspension system affording a high degree of movement, up to 30 degrees of oscillation, in pretty much all directions. 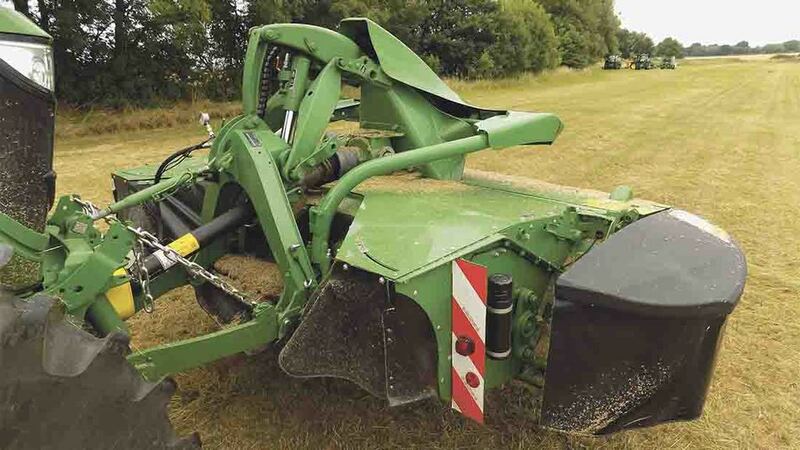 Effectively pulled not pushed, it also has plenty of ground clearance when raised – generous enough to clear large swaths with no need to raise the linkage. If the front mower should strike an object on one side of the bed, the mower has enough range of movement to be pushed backwards, twist, and raise at the same time. Although our relatively flat test field proved a doddle for the clever suspension, it does look like it would be up to some fairly punishing topography. Mower bed is raised hydraulically using a single cylinder, affording a rapid and powerful lift. When fully raised, the mowers’ suspension system locks solid, keeping the mower stable at the headlands, as do the rear mowers. At the rear, the R950R’s frame is 250kg lighter than the older-design 388 frame. 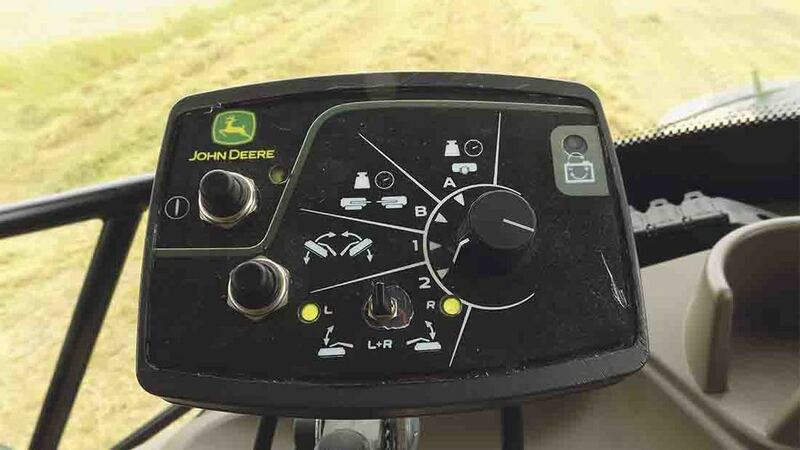 Whereas the old frame used a side shift mechanism to prevent missing crop in the corners, the new model uses a simpler, symmetrical width adjustment system. Hydraulically powered, overlap with the front mower on both sides can be done from 30cm to 50cm, and is a lot easier than before - just close down the width for the twisty bits then open it up for the straight runs. The rear mowers feature a hydraulic break back system which also consists of a damper to limit any swaying back and forth of the mowers in work. While the front mower requires one, single-acting spool to lift, the rear requires two, double-acting spools; one to adjust working width, and one to carry out all other rear mower operations depending on which function has been selected on the control box. 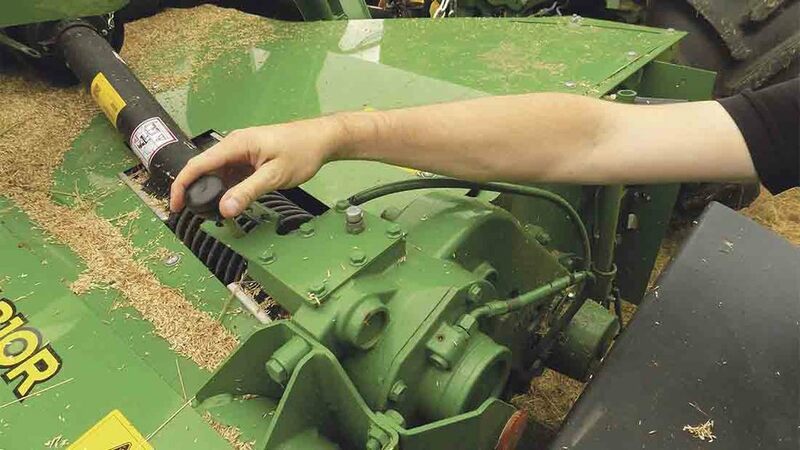 Without needing a constant flow of oil, the control box can be used to select various rear mower functions such as the ability to individually raise/lower the mowers, or all at once. This is simply done by flicking a toggle switch into one of three positions, then activating the hydraulics. In addition, mower bed pressure can be adjusted and transport folding can be carried out. It is a good system to use, and even better if you can control the front and rear services on a single joystick. When folding the rear mowers for transport, hydraulic latching now takes over from ropes. Also, the width of the rear mowers is automatically closed down, which reduces overall height when folded. We would still lower the rear linkage to reduce height further. Road lighting and marker boards are incorporated into the rear mowers’ arms, rather than a large frame sticking out the rear – should make it a bit easier when turning into tight gateways. Rear mowers can also be stored vertically via a dedicated stand. It is clear to see the new mowers have been developed to be more robust and cope with more power and throughput. Some useful design features such as two speed conditioner gear box, clever front mower suspension system and symmetrical adjustment of rear mower unit working width make setup and operation much more convenient compared to its predecessor. Performance was decent, with 245hp enabling a comfortable working speed of 12-15kph. If working in hilly areas or more output is required, perhaps more power would be a good idea.